A well maintained hut between Timaru Creek and the Dingle Burn, built 1941. The hut is owned by Dingleburn Station but sits on the edge of Hawea Conservation Park. The hut is maintained by DOC and open to the public. 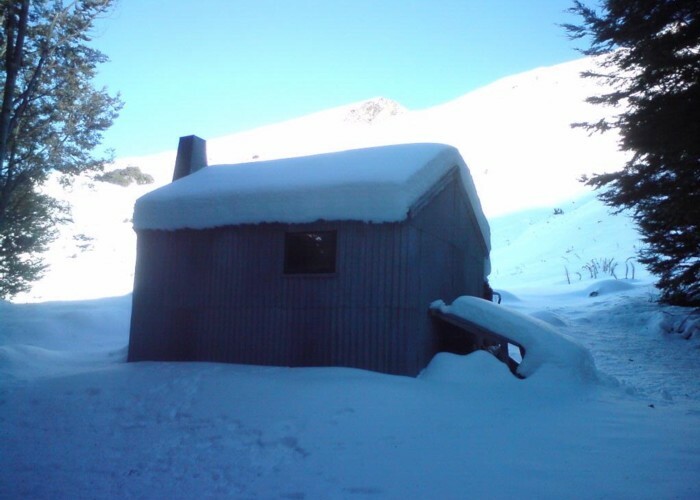 An iron clad hut with no insulation, so may be a tad chilly (though the 1.5 foot of snow covering it on the day I visited may have provided some thermal resistance). However, the bunks look new: 2 doubles and 2 singles, but only 4 single mattresses. There's an open fire and plenty of firewood around. Moonlight and Roses Hut • By madpom. Licence: cc by. Top Timaru Creek Hut via Chamois Creek east fork also reportedly an option. Added 20 July 2011 by madpommadpom. 1 revision 4 September 2013 by MatthewMatthew. 287 views in the past year (24 per month).